Transport Mission Mode Project – through its flagship applications ‘Vahan’ (for Vehicle Registration, Taxation, Permit, fitness and allied services) and ‘Sarathi’ (for Driving License related services) – has achieved 100% automation of 1100+ RTOs all across the country. 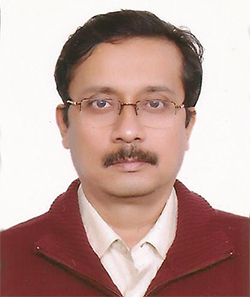 JoyDeep Shome, Senior Technical Director, National Information Centre gives more details. 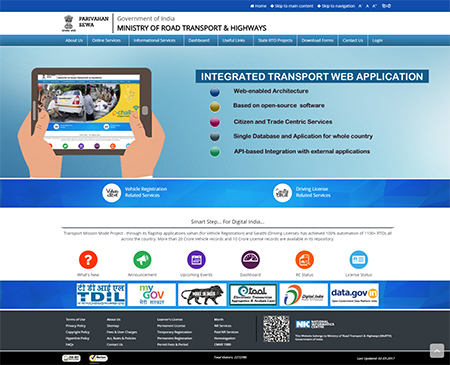 The project – driven and funded by Ministry of Road Transport & Highways (MoRTH) and executed by National Informatics Centre (NIC) – has been instrumental in consolidating the Vehicle Registration and Licensing related data from 1100+ RTOs to Statelevel databases (called State Registers or SRs) and a National Database or NR. The data, replicated and updated at regular interval, currently comprises 205 million vehicle registration records and 105 million driving license records. This enormous repository acts as the base for a large number of online citizen-centric applications and information services. The applications provide a complete range of services related to Vehicle Registration, Permit, Taxation, Fitness, Driving License, Learner Licence, Motor Driving Schools and allied processes. A new, centralized, web-enabled version of the Transport Application comprising the latest versions Vahan 4 and Sarathi 4 is currently being rolled out to replace the legacy Vahan/Sarathi applications running in distributed mode. The new Vahan 4.0 has so far been implemented in 180 RTOs across 17 states (Assam, Bihar, Delhi, Gujarat , Himachal Pradesh, Haryana, Jharkhand, Jammu & Kashmir, Meghalaya, Maharashtra, Puducherry , Rajasthan, Sikkim, Tripura, Uttrakhand, Uttar Pradesh and West Bengal ). New Sarathi 4.0 has been implemented in 460 RTOs across 17 states (Assam, Chandigarh, Delhi, Gujarat, Himachal Pradesh, Haryana, Jharkhand, Jammu & Kashmir, Karnataka, Meghalaya, Maharashtra, Odisha, Puducherry, Rajasthan, Tamil Nadu, Uttrakhand and Uttar Pradesh). By end of 2017, nearly all RTO running on distributed Vahan and Sarathi platforms will be migrated to this centralized platform. 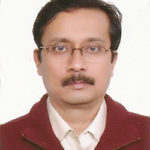 The new system will consolidate the database and applications for all RTOs across all states into a common, unified platform and deliver the core services of Vahan and Sarathi throughout the country. This architecture is built on the backbone of a robust data network with adequate bandwidth and built-in redundancy. The data and application for the whole country is maintained in a national level data center on cloud infrastructure comprising latest hardware, software and control infrastructure to achieve optimum operational performance, safety, security and availability. Further, the applications are equipped with a host of innovative features like Aadhaar Authentication, eKYC, Open API, multiple modes of Digital Payment options and so on. The consolidated services are offered through the portal https://parivahan.gov.in. NIC Transport Informatics Division is bringing out many new products, solutions and services on these web and mobile platforms on regular basis to cater to the increasing needs of the Citizen, Transport Departments, Trade and Government Agencies. This application allows Transporters to apply for and renew National Permit for Goods Vehicles through an online system where they can pay the stipulated permit fees through ePayment and get the downloadable permit. 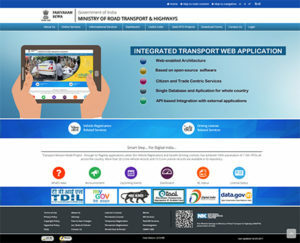 Initiated by the Ministry of Road Transport & Highways with active participation from all states/UTS, this application has been a widely successful one – facilitating the issuance of more than 57 Lakh National Permits and collection of more than 9,200 Crore revenue over last 4 years – which has been distributed to respective states in a transparent manner.